Bath are on the search for a new director of rugby. Bath director of rugby Todd Blackadder. 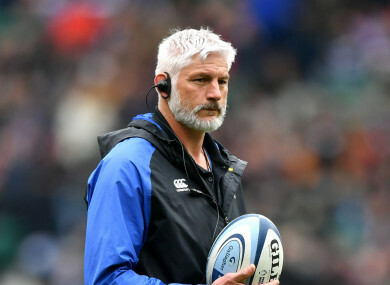 TODD BLACKADDER HAS confirmed he will leave Bath at the end of the Premiership season to join Japanese Top League side Toshiba Brave Lupus. Blackadder moved to Bath ahead of the 2016-17 campaign after a seven-year stint in charge of the Crusaders in Super Rugby. Since arriving in England, Blackadder has guided Bath to fifth and sixth-placed finishes in the league while they reached the European Challenge Cup semi-finals in his first season. Whether Bath finish in the top six and secure a return to the Champions Cup for 2019-20 remains to be seen, but Blackadder will not lead them going forward – even though he signed a contract extension in September. “It’s been an honour and a privilege to lead the blue, black and white for the past three years and I’m incredibly proud of what we have achieved,” he said in a statement. “It might not be silverware but together we have built strong foundations and I leave knowing that the best is absolutely yet to come. Bath confirmed Blackadder had been granted an early release from his deal, and the club will confirm his replacement in the coming weeks. Email “Blackadder to leave Bath at end of the season despite extending contract in September”. Feedback on “Blackadder to leave Bath at end of the season despite extending contract in September”.